The folding tops on 1951 Buick convertible coupes are operated by the Hydro-Lectric Power System described in Section 13-F. The following instructions should be observed by anyone operating the top to raise and lower it. 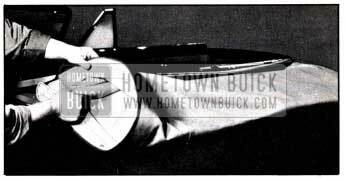 After top is lowered, raise it slightly by hand and pull the top material out from under the roof bow, so that it is in the position on the rear body panel shown in figure 13-45. Pull out top padding on both sides as shown in figure 13-46 and tuck it down into the top compartment. NOTE: Top material and padding must not be pinched by the operating arms of top. Fold over the corners of top material, figure 13-47, then roll the material forward into a compact roll and tuck it down into the top compartment. If it becomes necessary, in an emergency, to raise or lower the folding top when the ignition switch is locked and key is not available, or when the electrical system is inoperative, the top may be operated manually by slowly pushing or pulling on the top front rail. WARNING: Move top very slowly to avoid forcing fluid out of reservoir vent in the power- unit. Hydraulic fluid is inflammable and detrimental to car paint. If fluid is lost through vent, reservoir must be refilled to proper level (par. 13-28). To lower the back curtain use zipper fastener at lower right corner, sliding it upward, across the top and down to the opposite corner. Carefully lower the curtain into top “compartment. To install the back curtain, place it in position in opening and engage bottom zipper fastener at lower corner “A” then slide this fastener over to position “A-1” shown in figure 13-48. Provision is made for the adjustment of the folding top to correct any variation the top linkage and mechanism may have through use. 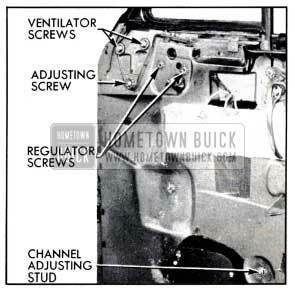 Service conditions will not be the same on all 1951 Buick convertibles, therefore, each job must be carefully studied to determine which of the following adjustments are required. In some cases, a combination of several adjustments will be needed to secure proper top alignment and operation. Loosen the three attaching bolts at top adjusting plate in rear quarter on side to be adjusted. See figure 13-49. 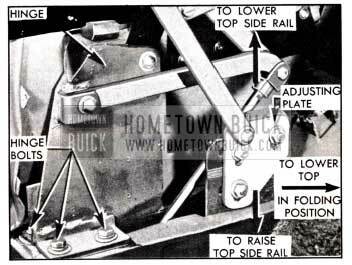 Move adjusting plate straight downward to raise the roof side rail, or move plate straight upward to lower roof rail. CAUTION: Do not move adjusting plate forward or rearward since the folded position of top will be affected. Install rear quarter trim panel, seat back and seat cushion. If the top does not contact the bumper on each side of top compartment when it is down in folded position, loosen the three attaching bolts at top adjusting plate in rear quarter, move plate straight rearward and tighten bolts. See figure 13-49. CAUTION: Do not move plate vertically because this will affect the position of top roof side rail in relation to top of door and rear quarter windows. The weatherstrip at the curved rear end of each quarter window is attached by a sheet metal retainer. To adjust this weatherstrip, pry the headed outer edge of weatherstrip out of retainer and remove. Loosen retainer attaching screws and shift the retainer as required, then tighten screws and install weatherstrip. If the methods given above do not provide proper adjustment it will be necessary to adjust the rear quarter window as described below. The rear quarter windows may be shifted up or down, forward or rearward, and may be tilted laterally to provide proper alignment and clearance in relation to door window glass run channels and the weatherstrips on top side rails. Each rear quarter window adjustment is a floating adjustment which is accessible after removal of the rear quarter trim panel. 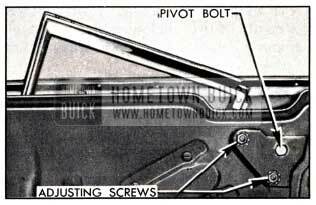 Loosening the two adjusting screw lock nuts and the window pivot bolt will permit shifting the window in direction required to secure proper alignment and clearance with adjacent parts. Turning the slotted adjusting screws will move upper edge of window inward or outward. See figure 13-50. After adjustment tighten adjusting screw lock nuts securely. Tighten pivot bolt firmly enough to prevent looseness and rattling of window but not so tight that window is hard to operate. 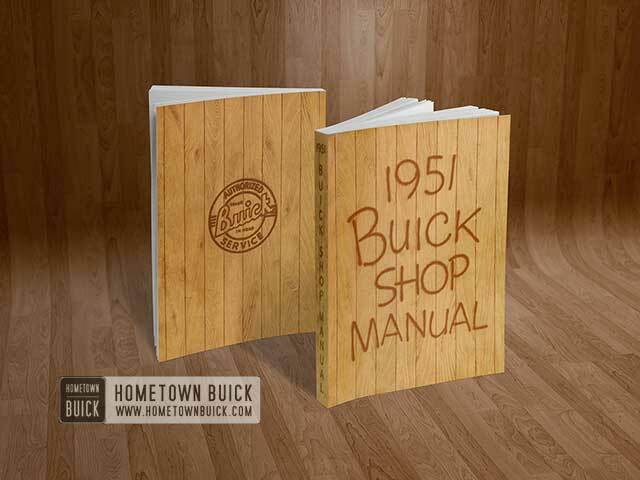 Door hinges and the procedure for aligning doors on 1951 Buick convertible coupes are similar to closed bodies described in paragraph 13-7. 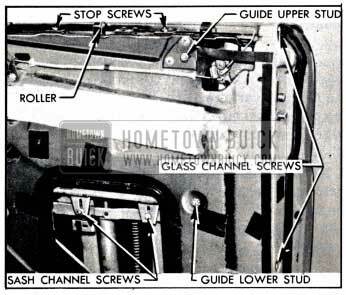 On 1951 Buick convertible coupes, each door window glass is protected by a metal channel, and a window guide is located near the lock pillar to support rear edge of glass when in raised position. The glass run channel on lock pillar is adjustable to aid proper alignment of window glass with the folding top. The windows are operated by the Hydro-Lectric Power System described in Section 13-F. Door ventilators on 1951 Buick convertible coupes are similar to ventilators on closed bodies except that each ventilator glass is supported by a frame which is attached to the door in such manner that ventilator may be adjusted to obtain proper alignment with window glass and folding top. Proper adjustment of the door window guide and the lock pillar glass run channel is necessary for free operation or travel of window glass. Adjustments of the window guide and the glass run channel must be made in conjunction with each other. After removal of door trim pad (par. 13-16), the window guide may be adjusted forward, rearward, in, or out at both upper and lower ends as required. Guide attaching stud holes are slotted to provide forward or rearward movement of both ends of the guide. In or out movement is obtained by adding or removing washers on studs between window guide and door inner panel. See figure 13-51. The lock pillar glass run channel may be adjusted to tilt the window glass inward or outward from a vertical line of travel. The hole in lock pillar at channel lower attaching screw is slotted to permit lateral movement of lower end of channel. Loosen upper attaching screw slightly then loosen lower screw and swing channel in required direction and tighten both screws. See figure 13-51. If window glass does not travel high enough to cushion against the weatherstrip on underside of top side rail, or travels so high that it interferes with opening and closing of door, the maximum height of glass may be set by adjusting the stop screws located on upper edge of door inner panel. See figure 13-51. When the window glass is all the way down, the upper glass channel should be flush with the top edge of door. If adjustment is required to obtain this fit, loosen the glass lower sash channel attaching screws, adjust glass up or down at each end as required, then tighten screws securely. See figure 13-51. The anti-rattler rubber roller on top edge of door inner panel may be adjusted in or out to secure proper contact to cushion the glass against vibration or shock when door is slammed shut. Adjust these rollers to a uniform light contact with window glass. See figure 13-51. If the height of window glass is changed very much it may be necessary to change the height of the ventilator (subpar. c), to maintain proper alignment of window glass and ventilator. To move upper end of ventilator inward or outward, loosen the ventilator frame adjusting screw lock nut and turn adjusting screw as required. It may be necessary to loosen the two upper screws slightly. Tighten ‘upper screws and adjusting screw lock nut when adjustment is completed. See figure 13-52. With frame attaching screws loosened, the ventilator may be shifted forward or rearward as required. Adjust division channel in required direction by means of the adjusting stud at lower end of channel. See figure 13-52.